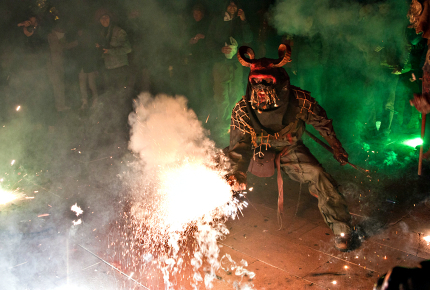 Fire-wielding men dressed as the devil chase Gavin Haines through the streets of Palma de Mallorca. The festive season is upon us. “They chase you with fireworks. It’s not dangerous, but you might get burned.” And so begins my introduction to the San Sebastian Festival in Palma, whose sodden streets throng with expectant revellers, mixed messages and the reassuring sight of fire engines, poised ready to extinguish something or someone. I wait anxiously, listening to drums echo down the street, getting nearer with every beat. In the distance the darkness lifts under the glow of fire: they’re getting nearer. “You run with them or you run from them,” explains the young girl next to me, her blue eyes flickering with the approaching fire. She’s talking about the pitchfork-wielding men, dressed as devils, who are now running towards us. And at that, she’s off; choosing to flee rather than face her demons, who are now running amok in the crowd. I stand firm, playing chicken with a man carrying splintered wood with a firework nailed to it. The devils keep coming, swaggering through the streets raining fire upon the crowd. Flaming embers land in hair and fizzle out on clothes. The smell of accelerant and weed hangs in the air. As the Correfoc (fire run) continues, a band formed of eight (yes, eight) drummers takes to a nearby stage. Their faces concealed by masks, they look as though they’re auditioning for a job in Slipknot. They repeat the same hypnotic beat over and over, prompting a group of youths in hoodies, who could be at Millwall away, to form a mosh pit. A man in a gasmask looks on menacingly, while other revellers sip lighter fluid from hipflasks and spit it onto burning torches. The next morning, with a heavy head, I swing by Palma Town Hall where I meet Bartomeu Bestard Cladera, the city’s official chronicler. He leads me into a room lined with pictures of Mallorca’s famous sons and daughters, which includes a military man called B. Gayman. You must be three years dead for your portrait to adorn these wood-panelled walls, explains Cladera, which is why man of the moment, Rafa Nadal, is nowhere to be seen. Under the watchful eyes of Mallorca’s celebrated dead, Cladera tells me about the origin of San Sebastian Festival. So what’s that got to do with Mallorca? Well, some years later, in 1523, a Greek priest fleeing the marauding Turks dropped anchor in Palma and brought ashore a bone belonging to none other than San Sebastian, which, weirdly, he was carrying with him. Having seemingly cured the town of the Black Death, the priest weighed anchor but stormy seas forced him to return. This was seen as a sign that the relic should stay in Palma, where it remains today. From then on San Sebastian became Palma’s patron saint and was celebrated for a week every January. 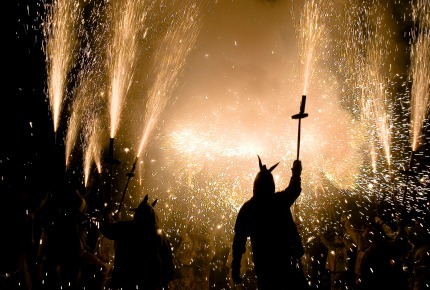 Traditionally, Palma’s upper classes honoured the martyr with a highfalutin ball, but, in the 1970s, the Mallorcan government realised this was boring so they welded the festival onto Sant Antoni, an island-wide jamboree celebrating Saint Anthony, who was famously tempted by the devil. Later that night I’m back on the streets of Palma, where the mayor starts another night of revelry by lighting a bonfire in the main square. This is followed by a drum procession with traditional Mallorcan dancing, bagpipes and a flotilla of giant figurines. Laden with wine and sausages, I shuffle through the crowds, stopping to cook the bangers on one of the public barbecues. The meat cooks, the music plays and, once again, Palma dances the night away, feeling the devil beneath its feet. 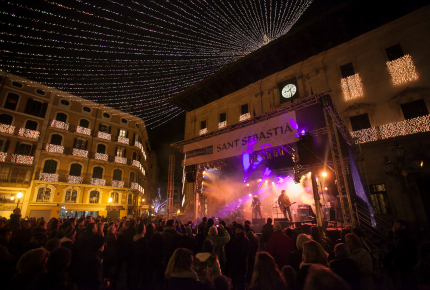 Next year’s San Sebastian Festival will take place from 14-29 January. If you’re planning on visiting, wear old clothes and avoid using hairspray at all costs. Ryanair and easyJet run regular flights direct to Palma from London starting at £50 return. Double rooms at Hotel HM Jaume III start from £82 per room per night (www.hmjaimeiii.com). Andreu Genestra’s venerable restaurant, Aromata, has tasting menus from €32 per person. Signature dishes include tuna ceviche with spring onion and sweet chili (www.aromatarestaurant.com).